There are many problems and issues you could face with your door. Whenever you do encounter one, do give us a call for professional garage door repair services you can count on! The signs that you have a bent track are quite clear. Your overhead door may be shaking while opening and closing. If the component is severely bent, the door may get completely jammed. Our check will reveal how bad the situation is. If possible, we’ll repair your track and straighten it so that it works optimally just like before. If the component is on the verge of breaking, we’ll install a new one which has the same size. Proper maintenance can help to prevent this and other problems with the tracks. Keep these components clean and ensure that they are firmly set into place. Even the smallest misalignment can cause more serious trouble. It’s easy to notice an issue with the electric operator simply because in most cases it just stops working. When the motor unit makes strange noise and the door is stuck, this indicates a problem with one of the internal hardware parts. Most often, the main gear is broken. This component is made from plastic and even the slightest misalignment can cause it to get damaged and to snap eventually. 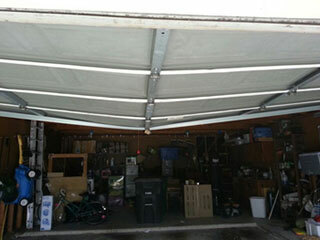 The good news is that we will replace it easily and quickly, no matter what opener model you have in your garage. Our garage door repair services cover chain, screw and belt drive openers, irrespective of their brand. Even the strongest steel panels at the bottom of the garage door can get damaged when they are exposed to road salts and/or corrosive driveway cleaners. Wood ones can rot if they are soaked with water and don’t dry quickly. It’s easy to tell where the rotting sections are. They are darker and feel softer when you press them even slightly with your fingers. Our job is to repair panels of all makes with care and to protect them in the best possible way. With high-quality exterior-grade paint and reliable vinyl bottom seal, which is strong and durable, your bottom panel should stay safe. Remember that wood doors require repainting every year while steel ones can be repainted less often. If it's time to get your door fixed, call our team at Garage Door Repair Eagan today!